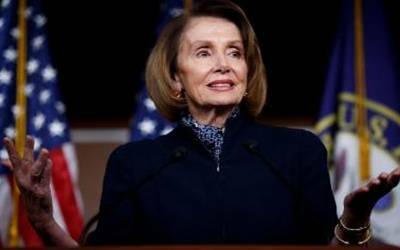 Washington, March 12 (IANS) House Speaker Nancy Pelosi is against impeaching US President Donald Trump, because "hes just not worth it", adding that the move would be "too divisive"
In a wide-ranging interview with The Washington Post on Monday, the country’s most powerful Democrat also said Trump was unfit to be President "ethically," "intellectually" and "curiosity-wise". "I’m not for impeachment," the 78-year-old said. "I don’t think we should go down that path, because it divides the country. And he’s just not worth it." Regarding her "relationship" with Trump, Pelosi told The Washington Post: "My relationship toward him is respectful, respectful of the office that he holds. Straightforward, just tell him what I think… So, yeah, respectful, honest and hopeful." Pelosi was irst elected to Congress in a special election in 1987 and now in her 17th term, she is experienced in all of Washington’s various forms of combat, power and perseverance. She is the first woman to lead a political party in Congress and, in 2007, was the first woman to become speaker of the House. After Democrats won control of the House in November following eight years as Minority leader, Pelosi fended off an effort by some in her party to replace her, and reclaimed the speakership. The veteran added that it is "public sentimen" that will guide her as she leads the House Democrats and seeks to use their powers as a check on a President she believes disregards the Constitution. Regarding Trump’s demand for a wall on the US-Mexico border, the House Speaker said "the President was advocating for a wall, that was a tangible, visible sign of discrimination". Trump’s demand for his border wall funding and the Democrats’ denial to grant it led to the country’s longest government shutdown that started on December 22 and ended on January 25. Pelosi’s comments published on Monday are perhaps her strongest yet against the issue, but the Speaker has signaled for months her resistance to pushing for impeachment.